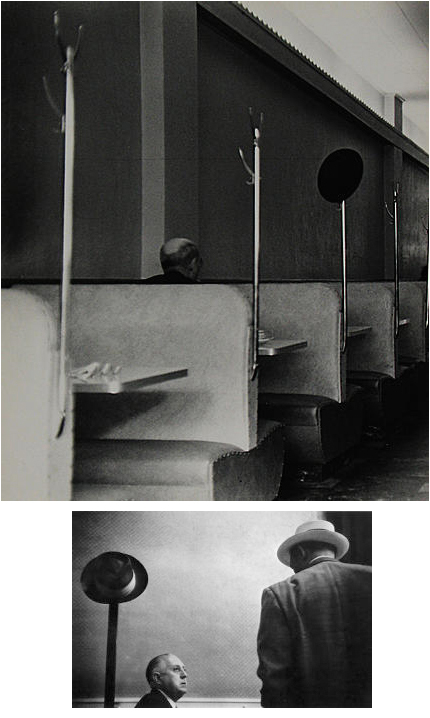 Tosh Matsumoto, up top, and Garry Winogrand, below. Interestingly, I think both pictures were taken around the same time, meaning, maybe the same decade. Matsumoto is part of the “Photographers of Japanese Descent” show at Howard Greenberg in NYC, which opens on March 14th. I’d link to the relevant info on their site, but the Greenberg site is engineered as a pop-up, boo-hoo. Then click on the current exhibition. Stupid pop ups. . . .
You’d probably like “The Ongoing Moment” by Geoff Dyer — he tracks the history of photography by following examples of the same type of picture through time. For instance, blind street musicians. There’s also a “same same but different” in Stephen Shore’s Uncommon Places and Joel Sternfeld’s American Prospects. Both feature pictures of people playing in a river in Yosemite, with Half Dome in the background.